I love me some pastels, perfect for spring! 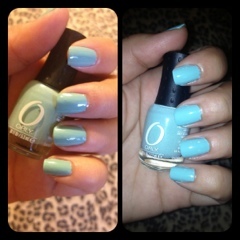 I bought this mini Orly Gumdrop last summer and finally brought it out again! This could possibly be a dupe for Wet'n'Wild I Need A Refresh-mint, which is another favorite. I didn't get to do a clean up and it's noticeable in the picture but, find that after I've showered it cleans it self up! I took a picture without flash (right side) and with flash (left side).